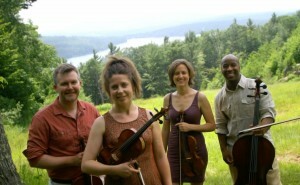 On Sunday April 14th at 3pm, the Newport String Project presents a unique collaboration with the award-winning Apple Hill Center for Chamber Music (NH). This concert will feature the internationally acclaimed musicians of Apple Hill in a collaborative concert with the Newport String Quartet and will include works by Andrea Tarrodi and Dmitri Shostakovich, alongside a performance of Mike Kelley's enchanting "Five Animal Stories" for String Octet, a musical evocation of Armenian folk tales. This free performance at Ochre Court is a not-to-be-missed event in one of Newport’s most stunning venues. This concert is presented in partnership with the Newport Daffodil Days Festival and Salve Regina University. All proceeds support the performance and educational programming of the Newport String Project.